Our greens harvester (by Jonathan Dysinger of Farmers Friend, LLC and sold through Johnny’s Selected Seeds) cut almost 4,000 lbs of greens this season. By October it desperately needed some love. When I took it apart to thoroughly clean, I noted all the bits that looked worn and needed replacing, and contacted Johnny’s and Jonathan for help. The following photos and suggestions are considered yearly maintenance on the harvester, especially when used frequently. Jonathan is working on a new design – 2.0 is lighter (by a 1.5 lbs!) and simpler. I look forward to seeing it in action and trying it out. Keep an eye on Farmer’s Friend and like Jonathan’s FaceBook page for updates. The first thing that started to slip this fall was the macramé roller. It would pop out of its holes and sit spinning on the shaft during harvesting. It was easily fixable (just pop it back in), but annoying when it happened three or four times each harvest day. The cause, it turns out, is not the roller itself, rather the harvester handle. Over time, the upright supports creep inward on the handle, making the space between them smaller, and allowing the roller to move in and out of its designated hole fairly easily. To keep the roller in place, all I needed to do was push those uprights back out to their proper position with good knock on the support while the protruding end of the handle rested on the work bench. 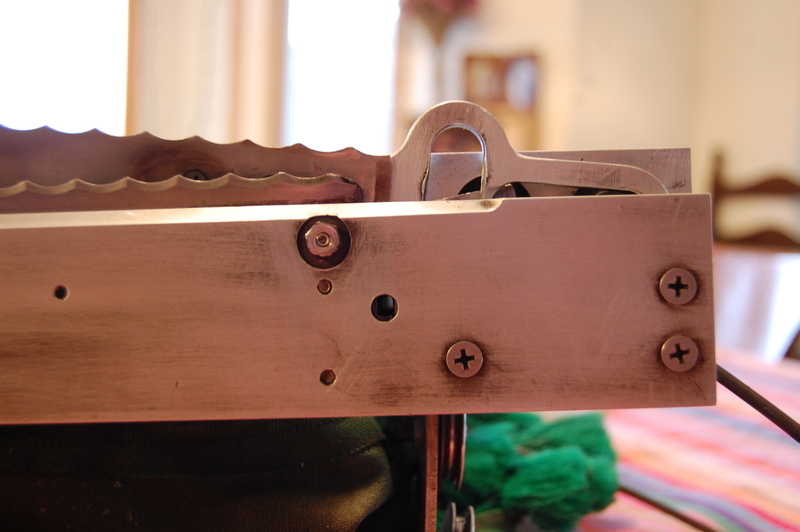 Once the handle bar is flush with the outside of the support again, it’s recommended (by Jonathan) that you drill a hole through the support and insert a screw to hold the handle in place. 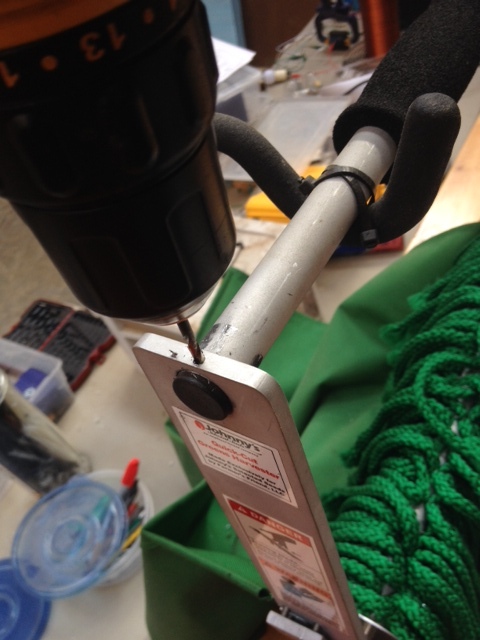 There are two discs that are supposed to be attached to the macramé brush, keeping it contained. They detached early on and have been loosely spinning around on the brush bar almost all season. They’re not detrimental to the harvester that way, but it’s an easy fix – super glue them back in place (Jonathan recommends JB Weld for a stronger hold). Early this fall, our cutter started running rough. It sounded choppy (har har) instead of nice and smooth. The culprit was probably the cam bearing. Ours had lost the rubber ring in the middle of the bearing and was knocking back and forth on the cam. This is another easy (and cheap) fix. The cam bearing is on Johnny’s website for $10. 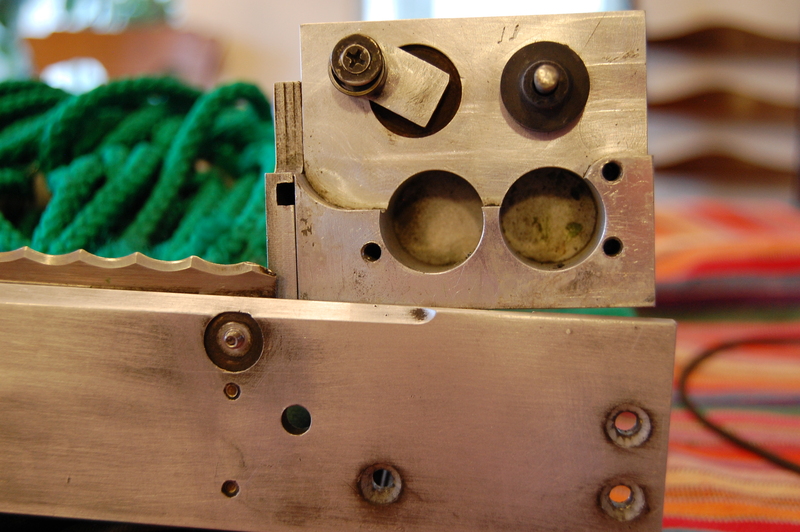 To replace, remove the 7 large screws on the bottom of the cutter, then gently pull the bottom down to expose the cam and cam bearing. 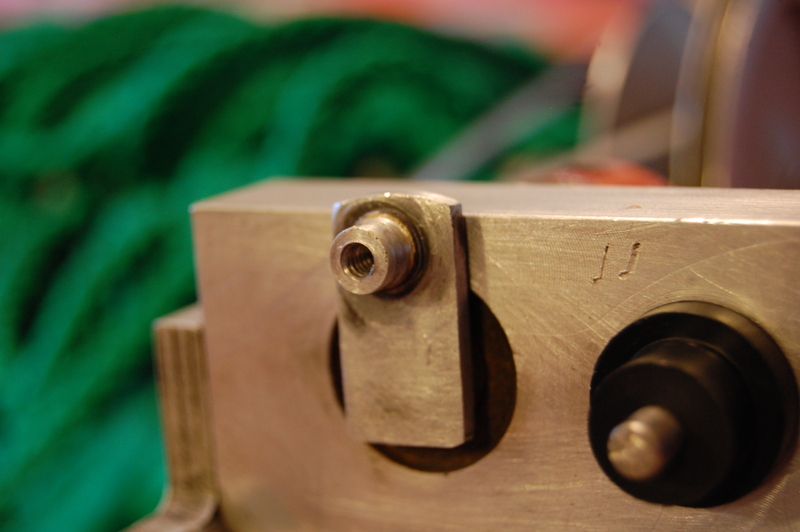 The pin that the black cam roller sits on is loose and rests between the bottom of the cutter and the top piece, so be careful not to lose that. Undo the screw holding the bearing to its pin, and pull it off. 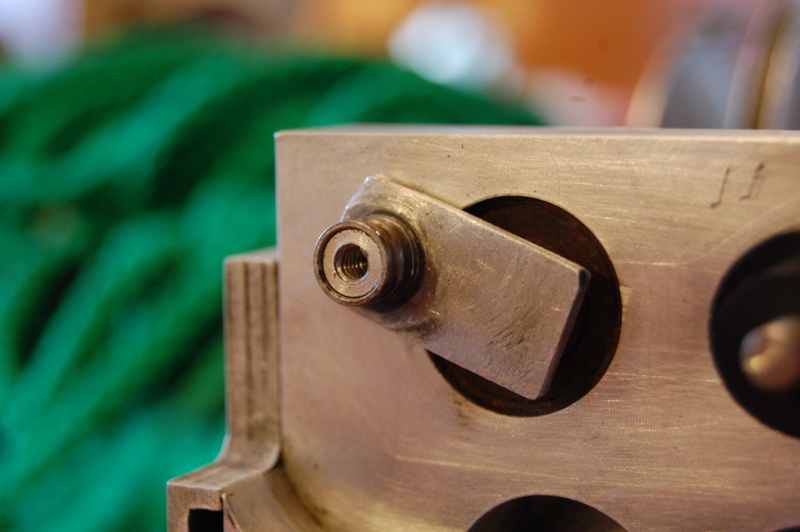 The inner ring can get stuck on the pin – it’ll slip off with pliers and force. Replace the cam bearing by sliding the new on onto the pin and put everything back together. Remove these screws to take off bottom of harvester. the inner part of the bearing was stuck on the arm peg. I had to pry it off with pliers. Cam arm peg for the bearing. 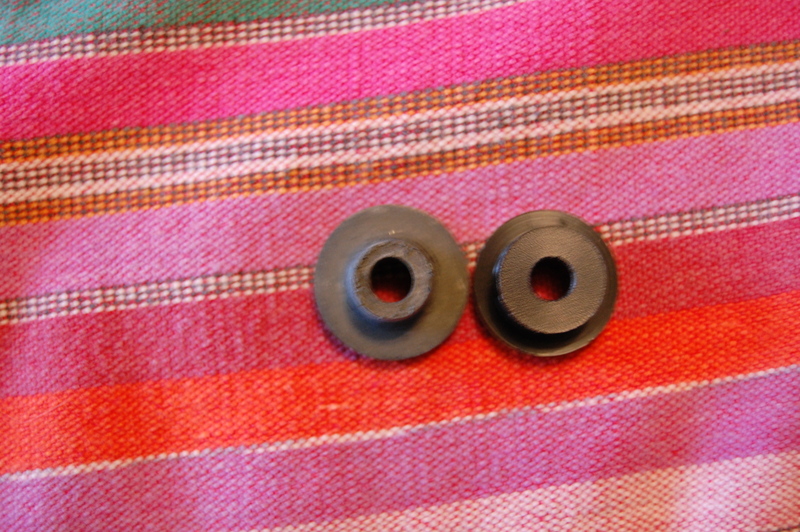 While you’re at it, replace the black plastic cam guide ($5 from Johnny’s). Ours had worn down to almost half its original size, another reason the machine was running roughly. Just pull the old one off, and put the new one on while you have the bottom of the cutter removed. Old roller on the left, new on the right. If your cam looks worn and stretched, replace it. I chose not to replace ours. The cams are expensive ($30) and while the entire thing will run smoother with a brand new one, I figure we can go another season without it. This is another replacement to be done while the bottom of the cutter is off and you’re replacing the cam guide and bearing. Replacing the blades on the greens harvester is obviously advisable as needed. New blades are expensive ($65) and this is another replacement that we’ll live with for the next season or as long as we need to. Replacement instructions are in the booklet that comes with the cutter. 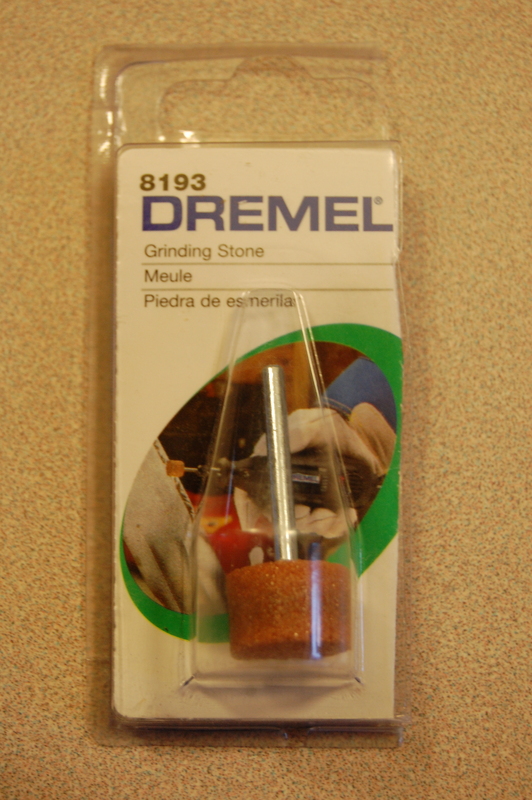 I’ve been sharpening our blades with an 8193 dremel grinding stone fitted into a cordless drill. 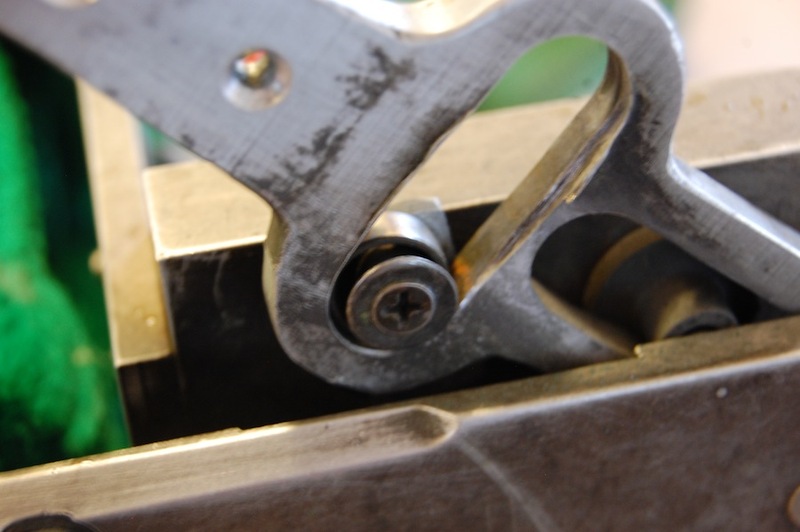 Sharpening is simple but requires a light touch – these instructions are also in the booklet. Rotate the Lovejoy coupling until the blades are lined up perfectly. Fire up the drill on its highest speed setting and run the stone on each scallop of the serrated blade, at the approximate angle of the scallop. Use light pressure and grind until each scallop has a clean, sharp edge. Do the same for the bottom blade. It doesn’t take more than a couple seconds per edge. When you can feel small barbs on the flat side of the edge, you’re blade is sharp. Finally, the blade pin. It holds both blades in place on the left side of the harvester (if you’re looking at it from the front). This little guy got worn out by July and I replaced it with a pin and clip from the ag supply store. Not ideal, but functional. Click here for a review of the Quick Cut Greens Harvester from June 2013. This time of year I like to organize all my records and analyze our numbers from the previous season. Bed feet planted, harvest totals, actual days to harvest, etc. Almost 4,000 lbs of baby greens! 1,700 lbs of arugula alone! 32% spike in cherry tomato production! It’s a very exciting month for spreadsheet nerds like myself. Harvest totals are old hat, but this is the first year that I kept track of our irrigation water. All of our overhead water comes from the irrigation ditch that runs behind the orchard, fed by the Jocko river which is fed by snow run-off and a spring. It’s managed by the Flathead Irrigation Project who turns on the ditch every May and off on or before September 15 each year. We have a system of hand line on the farm, and can run only one set of 10 or 12 three-inch pipes at a time with the old pump. 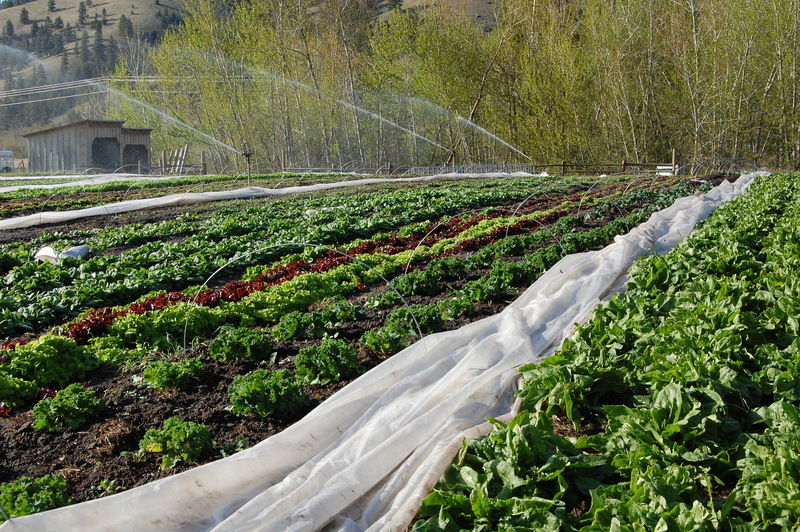 Veggies and cover crop areas are irrigated as needed, generally for 3-4 hours twice a week. Each line in the pasture runs overnight once a week. Because we lease our land, and we don’t deal with the water taxes or bills, I haven’t had to think about water use much at all. When we needed it, I just turned on the pump. No problem. This year, with the proposed water compact (read more about that here, it’s complications here and here), Steve, our landlord, asked that we record what we used. It always seems like a lot of water, but how much is it really? For those of you uninterested in the math, skip down the page to find some reflections, below. For all you ag nerds, carry on. … and add up every line of my irrigation log. The total for our 5.3 acres came to 8,941 total hours. In other words, if all the ditch water we used this season came from just one sprinkler, that sprinkler would have run for 8,941 hours. Then I could multiply those total hours by the estimated gallons per hour each sprinkler head emits to get the total number of gallons we irrigated with this season. To find the gph of each sprinkler head, I used the following chart and and multiplied the gallons per minute (gpm) by 60. 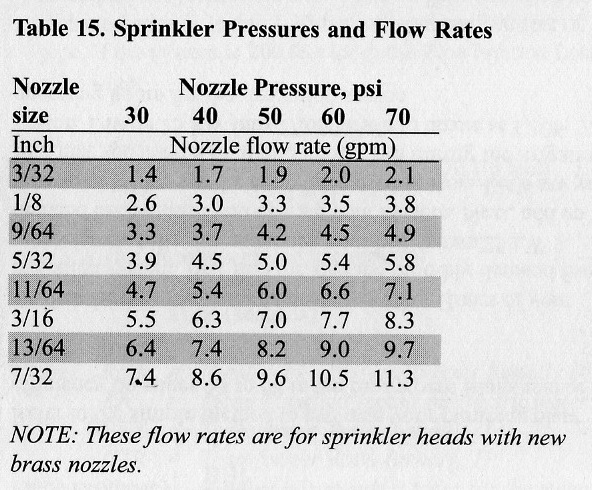 Most of our nozzles are 5/32″ and at 40psi, they emit approximately 4.5gpm. This chart is from the Montana Irrigators Pocket Guide, published by the National Center for Appropriate Technology (which is helpful and generally recommended). It just so happens that 1.39 acre feet is just under the 1.4 acre feet limit of the proposed water compact. That number was painstakingly calculated over 18 years of research monitoring rivers and agricultural land on the reservation. It takes into consideration (among many other things) in stream flows that keep fish and other wildlife at optimum levels and water needed for pasture, crops and livestock. This area of Western Montana gets an average of 15 inches of rain per year, including snow fall. Compare that to Las Vegas at 4.5 in per year, or the Hudson Valley (where we moved from in 2011) at 48 in per year. It’s dry. In three years, we’ve harvested crops maybe three times in the rain. The pieces of land that we don’t irrigate turn gold and brown by mid July, as do the surrounding hills. Water management is clearly an important part of responsible growing. I like to think that we keep this land as healthy and as naturally sustainable as possible, monitoring the soil saturation etc., but the natural state of this farm is not green rows of vegetables and crops. We rely completely on ditch irrigation and our drip system which we run off of the well. Without those infrastructures, all that remains is marginal pasture, brush, seasonal wildflowers, and sparse evergreens. With aluminum pipe, electric pumps, and man-made canals, we’re able to grow ten thousand pounds of vegetables annually, and roll in green grass in August. What we get from this soil is what we (and those who came before us) put into it: organic matter, manure, water, time, and care. We create this world that we sustain, balancing it as best as we can, encouraging the fungi, bacteria, insects, and moisture that keep our land producing. Our ditch feeds a wide corridor of riparian forest, home to birds, bugs, microbes, and animals that all contribute to the diversity of our farm. This winter the cottonwoods are home to two great horned owls, conversing in long low tones all night long. It takes a considerable amount of work to keep this artificial system going, but it’s also incredibly rewarding. 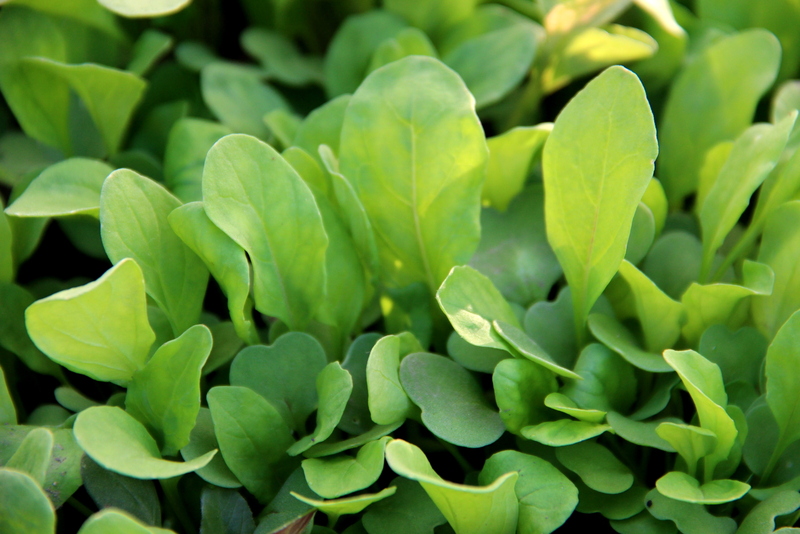 In 2012, County Rail Farm harvested over 2,000 lbs of baby greens – salad, arugula, mizuna, etc – by hand. That’s many many hours kneeling in the field with a knife and a plastic bin, cutting one handful at a time. While it gave us lots of riveting and often hilarious early morning conversation with Robin and Dylan, our harvest helpers, it took forever and neither our knees, back, nor hands appreciated the conversation. This year we’ve already harvested somewhere between 700 and 800 lbs of greens, and expect to double our production from last year. With that much more yield, Margaret and I (plus Heidi who started June 1) absolutely could not have kept up without the Quick Cut Greens Harvester. In fact, it gave us the confidence to seed more. This little machine was invented by Jonathan Dysinger and is sold through Johnny’s Selected Seeds, whom I have no connection to other than “customer #124983”. It runs on a battery powered drill (we’ve been using the DEWALT Compact Lithium 18v) and is simple in design. With two serrated blades running under a large brush, the greens are gently forced into the blades and then into a canvas basket behind them. It needs frequent dumping (into a box or tote) and can strain the back when used for more than an hour, but OMG we love this thing. One of us can harvest 150lbs of greens in a little over an hour while the others harvest everything else and start washing. The greens get cut faster, are cooled faster, and last longer. Our man power is used much more efficiently, and we’re able to grow greater quantities without choosing between hiring more help or spending 10 hours harvesting greens every week. Using the cutter has required only small changes in our greens production. We weed all of the greens thoroughly before they’re cut, more so than we did before as now there’s no human effort to avoid weedy patches. I’ve also been seeding the arugula and salad in narrower strips to accommodate the smaller width of the cutter (15″) so that the shoes don’t get caught in dense greens. It leaves the bed with even stubble so we can still cut our salad, mizuna, baby kale, and even arugula twice. It’s a dream for the kale and mizuna and it’s easily adjusted for a higher cut for that second round of salad and arugula. While the machine certainly doesn’t clean the bed like you can when harvesting by hand, that small loss is well worth the time and energy we save by using it. Margaret and I first heard about the Cutter from Jean-Martin Fortier’s review in Growing for Market this winter. At first, we weren’t convinced: it’s the very first of it’s kind which means it’ll have flaws… maybe we should wait for the next version… But when we heard a first hand account from our friend Victoria of Deluge Farm, we decided to buy one anyway. After using it for almost two months now, I agree with much of Jean-Marten’s review and his critiques. The basket could be stronger, the shoes could be designed so they don’t get caught on densely seeded greens, the brush could reach all the way to the edge of the machine instead of leaving 1″ gaps in the corners, it could collapse for easier transportation and storage, and it could be easier on the operator. All of these issues, I imagine, will be hashed out over at Johnny’s in the next couple years and by 2015 we’ll have an even better small-farm greens Cutter. Even with all those critiques, this is a fantastic investment for small growers. The next greens cutter on the market is enormous and sells for over $10,000. The Quick Cut Greens Harvester is a deal at $500 plus the cost of an extra cordless drill. We shot the following little video of the very first time we cut our greens with the Cutter. You can see that it’s early spring and the greens are little. I hadn’t started seeding the arugula in smaller strips yet (I’ve been seeding 3 strips of 3 rows of seed per bed, though 2 strips of 4 or 5 worked as well if not better). Also since this video, I took the shoes off of the machine (see below), I’ve learned better how to hold the cutter better balanced vertically, instead of pushing it through the greens, and how to dump it more easily and quickly. If you’re thinking about buying this Greens Cutter but you’re not convinced, come see this thing in action. We harvest Monday and Thursday mornings. Just drop a line and let us know when you’d like to come by. … And here’s a huge thank you and shout out to Jonathan Dysinger. Can’t wait to see what you do next, buddy. “I agree with you that the standoff feet tend to drag… You could try just removing them and free handing it. You may find that after a few times you get used to it. It causes less drag which allows you to cut faster. A little photo update of farm life this second day of May. First, a brief tribute to Steve Dagger, our landlord/caretaker. He just never stops. The intern/guest cabin looks amazing. When we first started talking about this project, I envisioned a hap-hazard shack. But this thing is a beauty. Steve has done a lot of work these past few weeks finishing the siding and putting up screens for the porch. We can’t wait to have people in it. With a fantastic wood stove (thanks Lindsay and Bob!! ), it’s open for winter visitors too… just fyi. 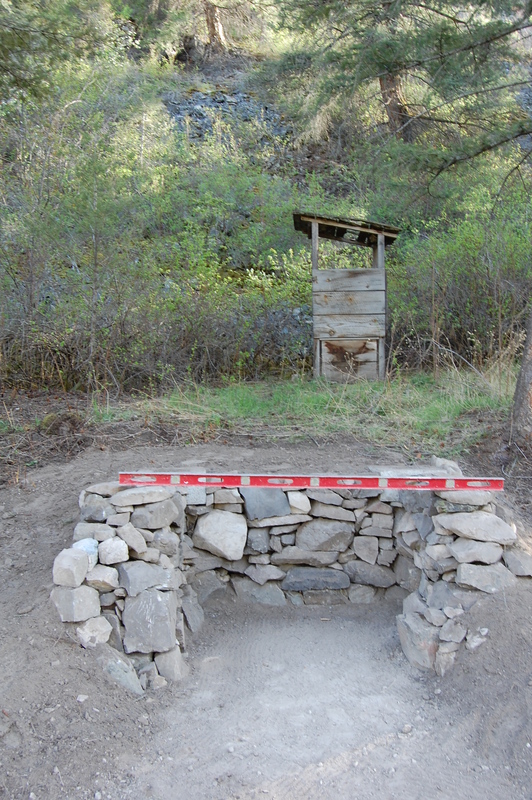 Our current visitors, Fennec and Orion, started the base for our new outhouse a few days ago and Steve topped it off today – perfectly level. He says he’d like to build a stone house one day, so if you want a stone house, give him a call. This will eventually be a two-seater outhouse. Blocking off one side at a time to let the other compost (not to be used on our produce). That’s the old outhouse in the background. Functional, but in desperate need of rebuilding. I take it back; the roof is definitely not functional. May first (yesterday) morning, there was a fine covering of two inches of snow. It was possibly the most beautiful morning I’ve ever seen at the farm. As the snow melted, blue skies came out, and everything stood tall under the sun. Then today. It was 65 degrees. Sunny. Gorgeous. The perfect spring day. You’ll see some of these friendly greens at market on Saturday, and more next week. Our greenhouse has desperately needed some extra ventilation (it was over 120 deg in there in July last year… in fact I don’t know exactly how hot it was, because my thermometer doesn’t go any higher. But it melted our seedling trays). And now it has some. This attic exhaust fan (HomeDepot, $89) comes complete with thermostat. It doesn’t have a fancy louvre system to go with it, but for a low cost vent solution, this is it. I was able to use a jigsaw to cut through the polycarbonate and put a quick frame around it, which will be sealed later. I’ll need to build a little door or louvre to keep warm air in when we want it, but it’s already keeping things cooler. Today’s second project was to rebuild the goat feeder. Tinkerbell enjoyed sleeping and eating INSIDE the old one, and finally busted it apart the other day. This is an altered version of what we started with. It no longer has bars for the goats to stick their head through (except for minerals), but the trough under the feed still saves a lot of fallen hay. Also, Lucinda is due in 5 days. LOOK AT THAT BELLY. 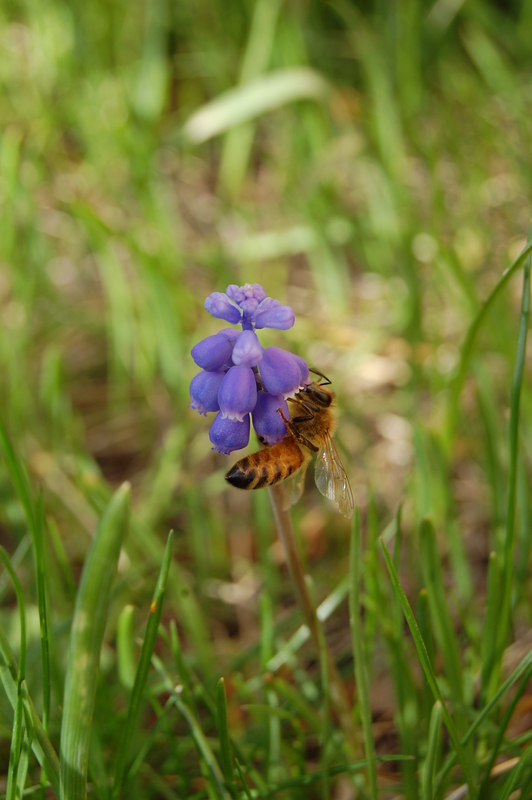 And, finally, a honeybee on a grape hyacinth. My favorite. SNAP Shares – How and Why? Periodically, we get an email or a phone call from a farm or organization around the country asking about our SNAP shares: how they work, is the program successful, etc. I thought I’d post my most recent email answering some of those questions. More general information and how you can join (*We have 4 more spots in our 2013 CSA for SNAP members – spread the word! *) can be found on our SNAP Share page. A brief overview of our SNAP Share program: We offer a small number of shares every year that can be paid for with SNAP benefits (i.e. Food Stamps). Members pay for their share weekly, as legally we can’t accept SNAP benefits as pre-payment. While this isn’t a traditional CSA practice (the purpose of a CSA is to provide the farmer with funds early in the season), it’s ideal for our members. Because of this weekly incremental payment system, we ask for a cash deposit at the beginning of the season as insurance for us – if SNAP members miss a week or two, we take those payments out of their deposit. We’ve offered SNAP Shares successfully since 2011, and look forward to continuing to provide local produce for low income families in our community. What need did you notice in your community when you decided to offer the SNAP shares (what motivated you to offer them in the first place)? Margaret and I have both been on SNAP benefits ourselves before, and we have a number of friends that have been or are currently on them. We know from experience that they don’t go very far and that it’s difficult to buy local produce as it’s more expensive and often less accessible. We wanted to offer shares to low income families to make local food easy to find, and we discount them because our shares (CSA shares in general) are just too expensive for families on SNAP benefits. Did you have others coming to you with interest in a share but not being able to afford it? 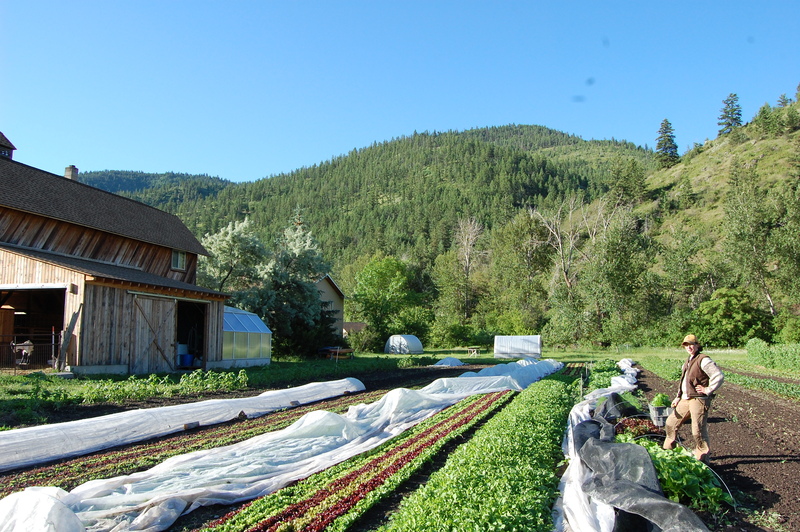 We began our CSA and SNAP Share program our very first season in Montana, which was also in the middle of our first year in Montana. We wanted to provide SNAP shares from the get go, and quickly found that few CSAs accept SNAP payments. I think many families and individuals on SNAP benefits don’t even think to look at CSAs as a source of produce until it’s presented (at farmers market, in the grocery/natural food store, in the coop, etc). How does the donation system for supporting those shares work out for you? Almost no one donates unless solicited, unfortunately. We sold t-shrits to raise funds last year, and with a couple small donations (all friends of ours), were able to make up for the initial discount we automatically give and drop the price farther. We secured a big donation from a local philanthropist this year, which allows us to cut SNAP shares by almost half, but I don’t think donations are a sustainable way to make up for the discount. We’ve thought about sliding scale shares, but without 10-30% of your members willing to pay top dollar, it doesn’t work. In the future, we’d like to work with Wholesome Wave or a different organization to double SNAP dollars when they’re used with our CSA. They do it farmers markets and the like, and they’re interested in doing it for CSAs, but they’re dependent on funding and not taking new applications at this time. What hoops did you have to jump through to get involved in the SNAP program in the first place? Getting certified to accept SNAP benefits is simple. At least it was in Montana. We sent in an application though the MT Dept of Public Health (as a “farm stand” – there is no application for CSAs), and about a month later we had our machine to swipe cards. It’s all free, it’s pretty easy, and you just have to go through your state department (as SNAP is allocated on a state by state basis). How did you determine how much to discount the SNAP shares from the full price? Our first season, we discounted shares by 20% because we knew that they were too expensive for SNAP members and decided to just eat that loss. We found that even with that discount, almost all our SNAP members paid with cash or check at the end of the month when their benefits ran out. So the following year we sold t-shirts as a fundraiser to discount them farther (and to make back that 20% loss on our part). It was successful and we were able to discount the shares by slightly more than 20%. We had fewer members paying cash at the end of the month and felt like we were able to offer our shares at an affordable price for low income members. As noted above, I’d like to use a double buck program to cut the share cost in half every year, making the shares truly affordable. We are very proud to offer our SNAP Shares and truly believe in fresh local food for everyone. If you have other questions about how our shares work, check out our SNAP Share page or get in touch with us directly. The more farms and organizations that can offer affordable and accessible produce to low income families and individuals, the stronger and healthier our community is. This season Margaret and I are going to try and increase our production a little. We’re interested in growing more on the small amount of space we cultivate. While many farms in our region are taking advantage of the NRCS cost-share high tunnel program, we’re taking a different approach. I want to extend our season a little, but I don’t want to tie up a portion of our land in permanent plastic. So I’m building low tunnels instead. A 6’x100′ tunnel will span two beds and can be put up and taken down in a couple hours. 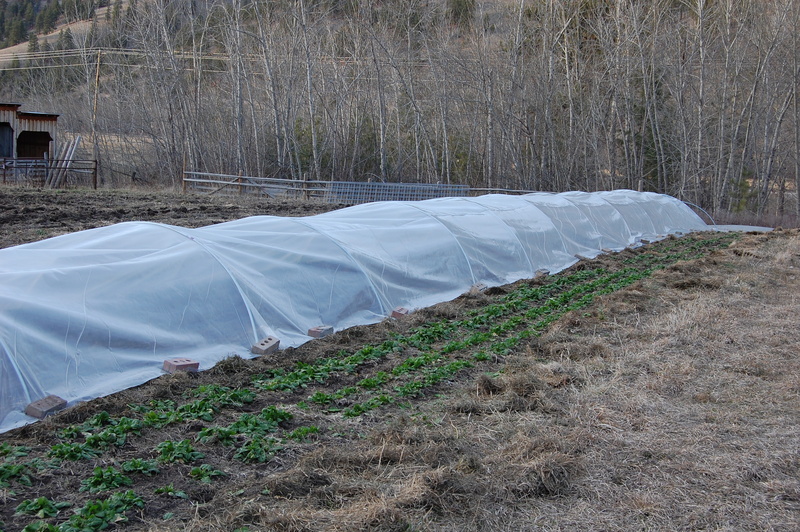 Moreover, to cover the same ground as a high tunnel, low tunnels would cost about a 15th of the price. These low tunnels are built with standard 1/2″ or 3/4″ EMT electrical conduit, available at most hardware stores for as low as 1.90 per 10′ piece. This stuff is soft enough to work without heavy equipment, but strong enough for a small tunnel. The key is bending the conduit. Johnny’s Selected Seeds sells two different “Quick Hoops” pipe benders: one for a 6′ wide by 3′ tall tunnel, the other for a smaller arc, 4′ wide by 4′ tall tunnels. While they work well, they’re costly. $59 before shipping. So after calling around to some buddies to borrow one, I realized I could build one. Thanks to this awesome post by the folks at IttyBittyImpact, I built a perfectly functional bender in about 10 minutes from wood scraps on the farm. The basics are simple. Cut out a portion of your circle then sandwich that piece between two boards. 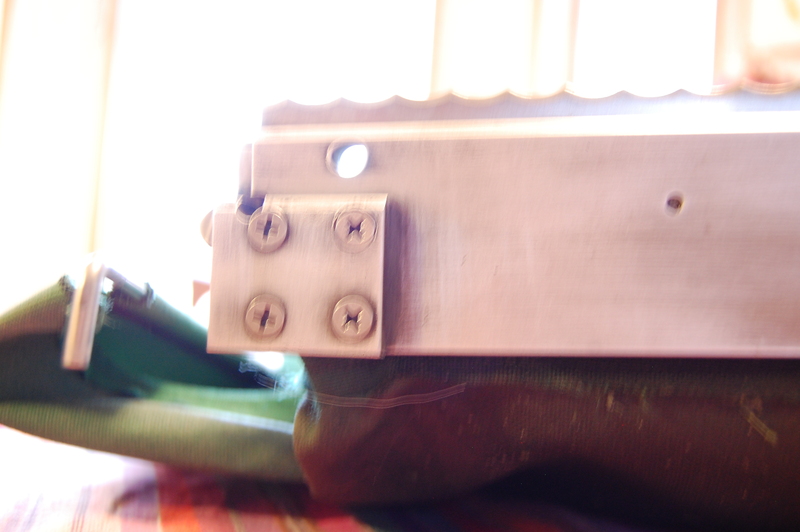 Lastly, screw in a brace on one end of the bender to hold your conduit in place while bending. 1. Determine the radius of the tunnel you’re building. For the 6′ wide by 3′ high, the radius is 3′. For the taller and narrower tunnels, the radius is 2′. 2. Build a giant compass. Either cut a piece of scrap wood or piece of string to the length of your radius. 3. Attach one end of your compass to something stationary (or have someone stand on it). With the other end, trace a portion of your circle on piece of 3/4″ plywood. 4. Cut out your circle. This is what the conduit is going to be bent around. 5. Sandwich this bit of circle between two boards (at least 2′ long and 1′ wide), ensuring that the boards exceed the rounded edge of the plywood so that when you’re bending the conduit you have an easy track to follow. Screw it all in place. 6. 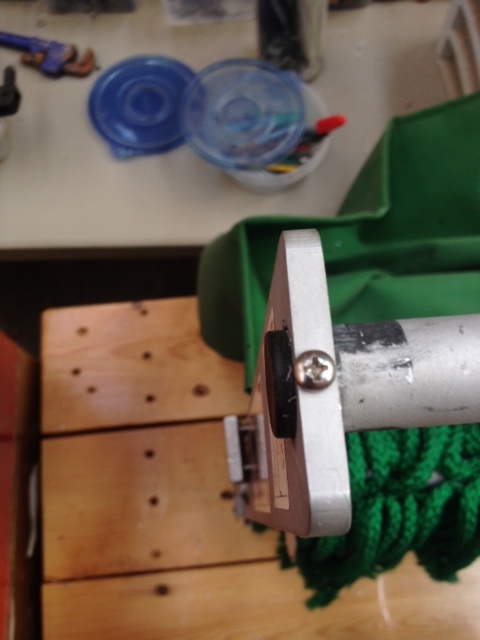 Place a block of that 3/4″ plywood between those boards on one end of your new bender. Leave enough room to fit an end of conduit between the brace and the rounded edge of the plywood. Screw this securely in place. This brace holds the conduit in place while you’re bending it around the circle. 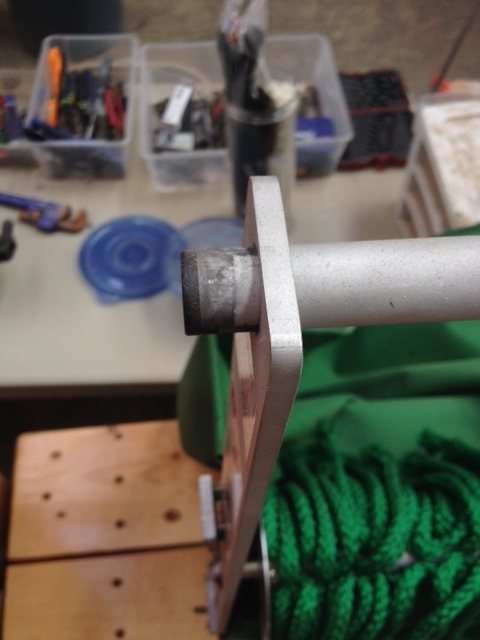 Raduis measure – I just held one of end of the radius measure in place while I traced the circle onto a piece of plywood. Then cut it. Here’s that hole between the block and the plywood arc that holds the EMT in place while it’s being bent. 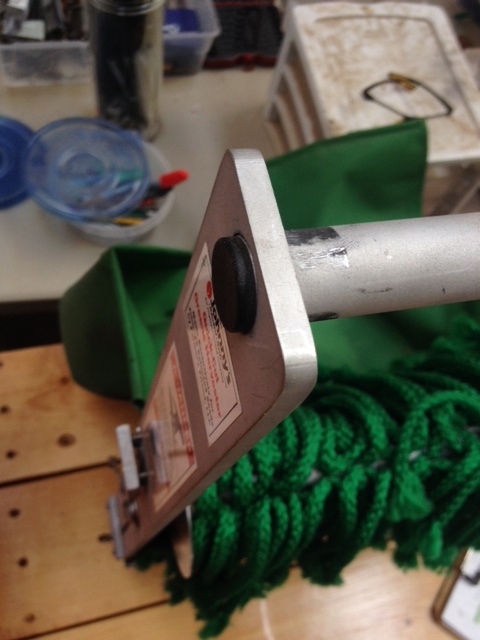 You can see that I used two pieces of 1/2″ plywood to make my arc instead of one 3/4″ piece. You’re done! 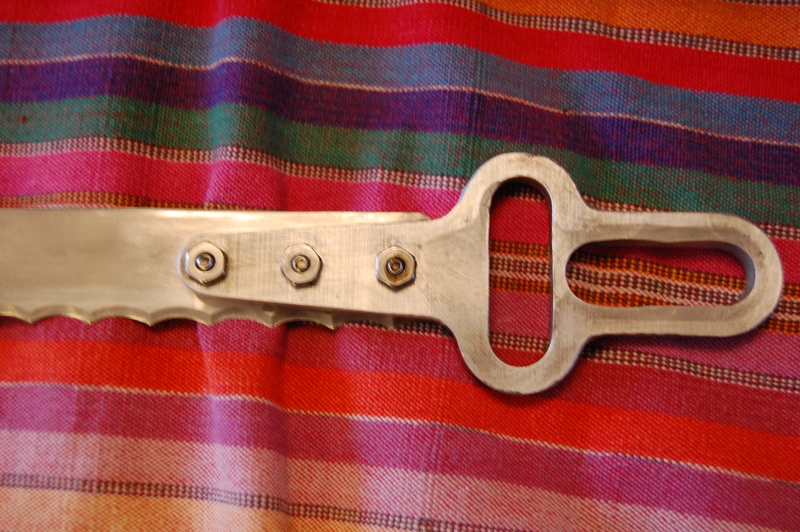 Clamp this baby in place and put one end of your pipe in your bender and bend away. Place one end of the 10′ conduit into the bender. For a 6′ hoop, you’ll need to bend the entire piece so start with the end of it even with your brace. Bend it around and then feed about a foot through the brace end of the bender and bend again. Repeat until you’re half way through and then pull the conduit out of the bender and switch sides. This helps keep the circle even on each side. (For 4′ hoops, you’ll feed about 4′ of the conduit through the bender before bending and you’ll only need to bend it once or twice). You can see that the hoops aren’t perfect, but they’re close enough. Next get yourself some plastic (Johnny’s has 10’x100′ pieces for about $80, or cut Nolt’s 24’x100′ for $90 in half) and set ‘er up. If you experience high winds, you’ll want to dig in one long edge of the tunnel. 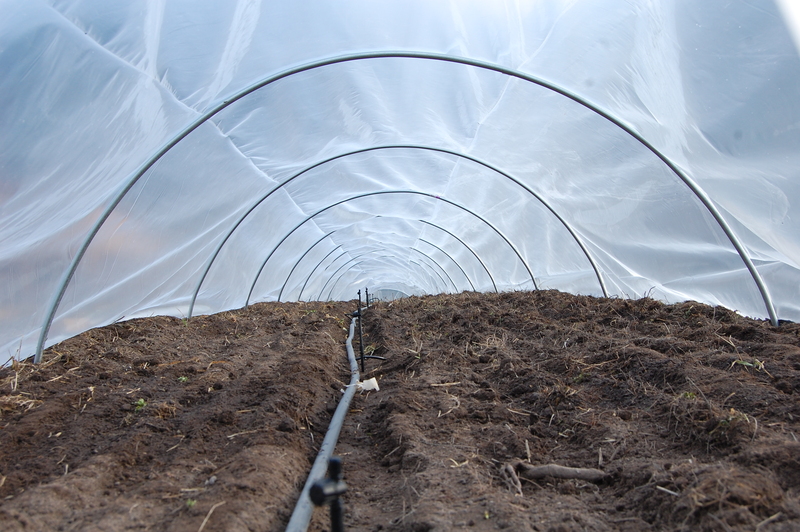 I’ll till the soil, seed it, and set drip before putting up our tunnel. I’m experimenting with some micro sprinklers for early greens, but the rest will be watered via drip tape or tubing. The plan is to grow our early crops under tunnels and then take them down, till, and re-seed (salad, arugula, or other fast greens) for a second harvest. With the warm February and March we’re having, we should be able to get a jump on the season and make better use of our land in early spring. We slaughtered Leo on Friday (thanks Robin, Dylan, and Steve for your help – couldn’t have done it without you), and I butchered the carcass yesterday. Literally. I feel like I really screwed up some of the cuts, but for a first attempt, I think it went alright. I didn’t photograph the slaughter, but I did take some photos of today’s process. After skinning, we left the carcass to hang in our cellar (45-50 degrees F) for a little over 24 hours. The meat had dried slightly on the outside, forming a protective layer over the inner, more tender, pieces. I have another photo of Coda looking curiously down from the stairs, but it didn’t show the goat as nicely. Tools are important. I think I went a little overkill on the number of knives I sharpened, but it was nice to have choices. 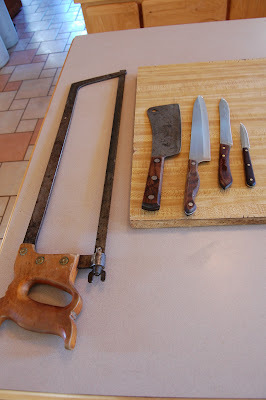 The big bone saw was Jane’s grandfathers, and while it probably needs a professional sharpening, it made the process 200 times easier. Much to Margaret’s dismay, I brought the goat into the kitchen to butcher. There’s just not another place with a long flat space, easy access to water and sanitary equipment, and good light. His hanging weight was close to 30lbs, but by the time I weighed each individual cut, it came to about 20lbs. This is the diagram I was following. In the future, I’ll watch a few more youtube videos and do a little more research before I get the carcass from the cellar. While it was helpful, this diagram left me with many questions. And here we are. Some of the cuts came out very well … the easiest ones like the legs. Others I did a pretty rough job with, having trouble sawing through the spine on several occasions. The guy in my youtube video must have a really really sharp saw. He did things in seconds that took me 10 minutes and a fair amount of frustration. The girls (Lucinda and Ke$ha) seem unaffected by Leo’s absence. While he was a sweetheart with us, he was a bully around them and the place has been just that much less chaotic the last few days. A pot is still simmering on the stove from yesterday afternoon, making goat stock. I picked apart the few bones with meat on them for dinner last night – goat tacos. It needed more lime, but the meat was delicious. If you’re interested in butchering, check out Mark Dommen’s video. He goes fast, but it’s helpful to see someone do it in a professional setting. I didn’t manage to load the entire video until after I was done, but I would recommend it. When I find a book that’s more helpful than that little diagram, I’ll post it. If you’re reading this, you know how to butcher, and you’ll be in Western MT next fall, hit me up. Thank you Ann Hart for our new washing machine! It really makes all the difference. Our new setup in the warehouse. (The three sinks and scale were already in place). After harvest, greens (in this case saute mix) are dumped into the first of the three sinks for an initial rinse. All of our greens are rinsed three times through all three sinks before ending up here, in lingerie bags. In bags, greens get spun in the washing machine (cleaned thoroughly and used only for greens). Many small scale and even large scale farms use washing machines to spin dry their greens. The machine is powered but not hooked up to the water line. That way, even if we accidentally start it on the wash cycle, we won’t have soapy salad mix. The greens (arugula here) are sorted into bags by weight for farmers market, wholesale, and our Farm Shares. 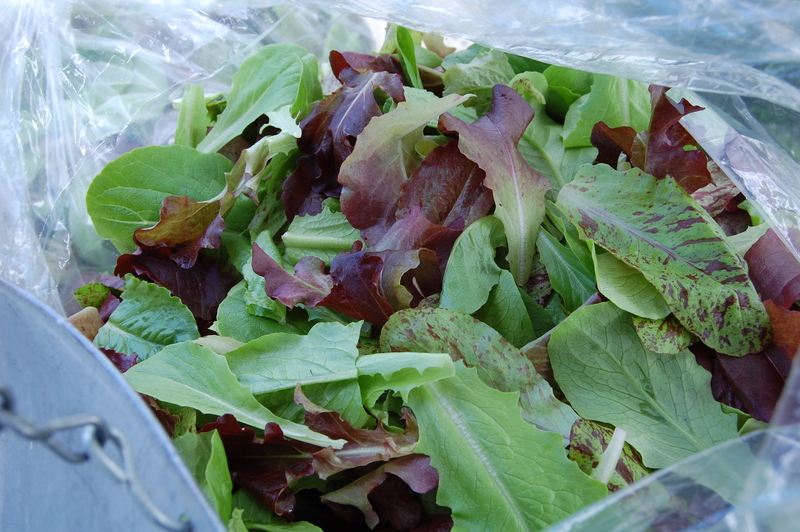 Packed into 3lb bags, we sell arugula to WMGC (Western Montana Growers Co-Op) in cases like this.